On 21 November 2013, Department of Genetics and Pathology is a Part of Pomeranian Medical University in Szczecin organized a one-day workshop on the topic of “Modern food - the regulatory aspects of an introduction to EU and Polish Market”. 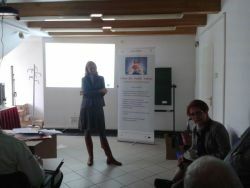 The workshop was conducted by Joanna Krakowiak and Dr. Ewa Butkiewicz – lawyers from Warsaw law office Wardyński I Wspólnicy. During the workshop speakers familiarized participants with the legal environment of companies in the sector of life science. They were especially focused on the topic of development and marketing of dietary supplements and foodstuffs for particular nutritional uses and also on the liability of the manufacturer for dietary supplement. All discussed issues were considered in the context of the Polish and EU law, which strongly influences national law in this area of interest. In addition, the event was opened by Prof. Jan Lubiński, leading West Pomeranian Scientist in the area of nutrients and supplements, who gave a presentation on the latest research findings on relationship between microelements and cancer risk. The workshop attracted a lot of interest among scientists, whose field of scientific research is related to the topic of microelements, supplements, drug production and conducting clinical trials. On 13.12.2013 Pomeranian Medical University, which is Project Partner 2 in Eco4Life Project organized a workshop on topic of “E-cigarettes – myths, facts and their role in achieving a tobacco-free Poland”. The speaker during the workshop was Dr Delon Human, international lecturer and health care consultant specializing in tobacco harm reduction, global health strategy, corporate and product transformation and health communication. He is the immediate Past Secretary General of the World Medical Association (WMA), and current Secretary-General of the Africa Medical Association (AfMA). He is a fellow of the Russian and Romanian Academies of Medical Sciences. During the workshop Dr Human discussed the context of nicotine use and general idea of e-cigarettes. He was focused especially on benefits of using e-cigarettes, but concerns about it were also mentioned. At the end partcipants and speaker discussed the opportunity for a tobacco-free Poland.